Seating There are 6 products. Designed by Jeff Weber and Bill Stumpf for Herman Miller® What if a chair could do more than just minimize the negative effects of sitting? Bill Stumpf and Jeff Weber designed the Embody Chair with that question in mind. The result set a new benchmark for ergonomic seating technology. Adjustable Arm Graphite Base Size B and C available ! 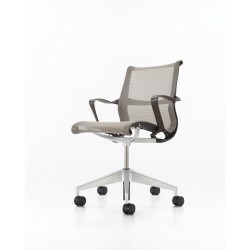 Designed by Studio 7.5 for Herman Miller® Getting comfortable can be a process. With Setu Chairs, that process is instantaneous. The unique Kinematic Spine and innovative Lyris 2 suspension material work together to provide the right balance of flexibility and support from the moment you sit down.